The vast majority of portable basketball systems for sale are made by two companies: Lifetime and Spalding. Both of these companies make quality hoops, but it does somewhat limit the variety of basketball hoops that are available to buy. With that said it is encouraging to see Silverback, who specializes in in-ground basketball hoops, jump into the portable basketball hoop market with the Silverback NXT Portable Basketball Hoop. Another reason we are excited about the Silverback NXT is the numerous unique features that it has not found on any other portable basketball system we’ve seen to date. The most visually obvious of these features is the backboard. The Silverback NXT features what Escalade Sports calls an “infinity backboard”. Most backboards have a metal frame that the backboard attaches to. In the case of the Silverback NXT Portable Hoop the backboard does not attach to a metal frame and instead wraps around at a ninety degree angle via a technique called flanging. Flanging makes the material stronger and more stable. At each of the four corners of the backboard it attaches to the support system. 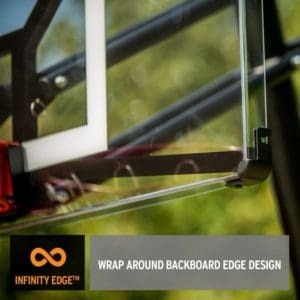 Lastly, the infinity backboard just looks freaking cooler than most other backboards out there. The infinity design gives the hoop a clean and sleek look due to the absence of the metal frame. 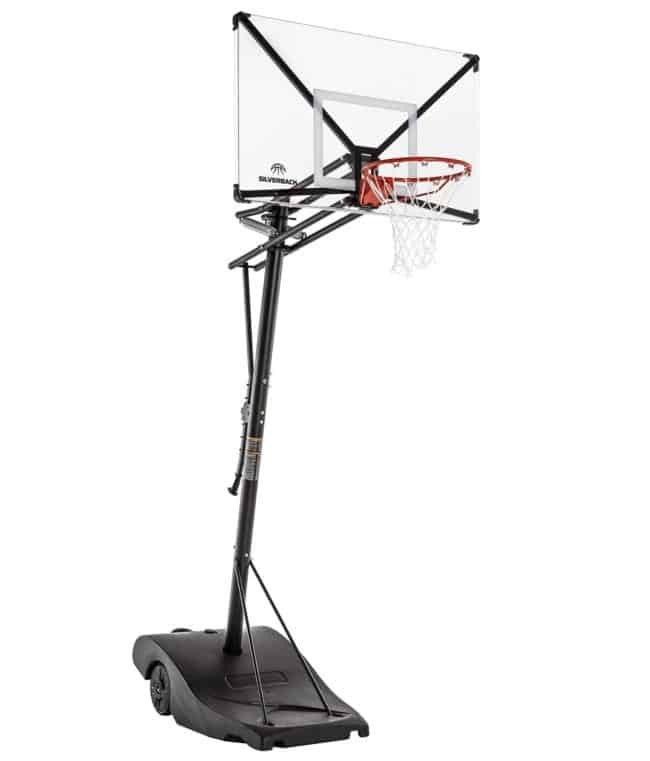 The Silverback NXT Portable Hoop also has an exclusively designed ErgoMove base. 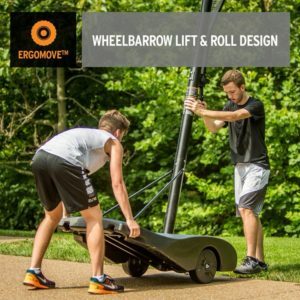 This base has two large wheels made to make transporting the hoop easier. There are also two hand grips on the sides of the base so that you can easily get a stable grip when moving. Beneath the fill base there are two metal bars that run the length of the base reinforcing the hoop structure and offering enhanced stability. No other portable basketball hoop that we know has this feature on their base. One of the biggest pain points when it comes to recreational basketball hoops is the amount of time and effort assembly can take. Often times assembly requires several hours and several people to put together a hoop, which is then further complicated by directions that are lacking in clarity. Thankfully, the Silverback NXT Portable Hoop has you covered if you don’t want to spend hours upon hours assembling. Silverback states that their NXT hoop only takes 90 minutes to assemble, but there have been some buyers that claim it took them longer despite being fairly handy. Either way, this portable basketball hoop should take you less time to put together than most others. As for the rim on the Silverback NXT it is a pretty simple one spring setup. The spring is exposed to the elements so rust could be a concern over time. However, the bounce and strength of the rim is impressive. We recommend that if possible to bring the Silverback NXT Portable Hoop inside for storage during the winter months. This portable basketball hoop’s height is adjustable from 7.5 feet to 10 feet in increments of six inches. The actual adjustment range is pretty standard among portable basketball hoops, but many other similarly priced hoops can be adjusted in infinite increments. The biggest downside to this hoop is the price. The 50 inch version of the NXT will run you about $500, while the 54 inch version will set you back an estimated $600. This is in the mid-range of hoop prices and there are some other basketball hoops at this price that we’d consider a better value. No doubt that the Silverback NXT Portable Basketball Hoop brings something unique to the table that no other portable basketball hoop can match. We hope to see more portable basketball hoops from Silverback in the future because we feel they can add variety and force other hoop manufacturers to step up their game as well. We wish the pricing of the NXT was more competitive when you consider at the same price you can get a Spalding 60 Inch Acrylic Portable Basketball System. Once again the manufacturers at Escalade deliver a high quality basketball system at an affordable price. This system is ideal for recreational use, and perfect for any family looking to install a hoop into their driveway or backyard. Durable weather resistant DuPont paint covers the pole, and zinc coated hardware, along with powder coating 18” up the base mean that you will have some serious competitive fun for years to come. The swedged two piece pole systems give near identical stability, shock absorption, and safety to that of other pricey single pole systems. Professional grade 8 millimeter thick glass adds to the safety of an already ideal home basketball system. Besides the breakaway rim and shatter resistant glass, Escalade Sports has also added a piece of thick padding along the pole to assure you that any hits will be cushioned and safe. Several added features add to the safety of the system and the players involved, making this one of the best hoops for any typical American family. For most American families, the Silverback SB-60 In-Ground Basketball Hoop is one of the best available hoops on the market. The price is extremely fair for the quality of product you will get, and due to Escalade Sports long lasting history as a source of trusted and reliable sports equipment; you know that you are getting what you pay for. The safety features and weather resistance all add to making this a solid in-ground home basketball system for your family.